A musical adaptation of Louisa May Alcott's beloved book LITTLE WOMEN featuring Music composed by Diane El-Shafey, accompaniment by Carma Jones and book by Meredith Bean McMath. Like Alcott's book, the musical begins as budding writer Josephine March has her sisters act out one of the many of her dramatic tales. But, in the adaptation, Jo's story turns to song and all the stories from her vivid imagination come to life in a grand opening number: here is the evil queen battling with a valiant knight, a prince turned wolf surrounded by good fairies who free him from his curse, a puppet ballerina's strings are cut and she’s suddenly free to dance, etc. Each song in “A Musical Little Women” is written to enhance the inner hopes and fears of Jo, her sisters, her mother and all those they love. ​Written for 26 cast member, the musical includes two full ballroom scenes. A MUSICAL LITTLE WOMEN premiered in 2013 at Franklin Park Arts Center, Purcellville, VA. Note: McMath, El-Shafey and Jones produce adaptations only when there's a strong purpose - such as enabling modern audiences better access to the meaning of the original - and works with great respect for the original author's intent. Further information on adaptation can be found here. "... a work of both soaring emotions and intimate poignancy..." - Diane Jackson Schnoor, DC Metro Theatre Arts. 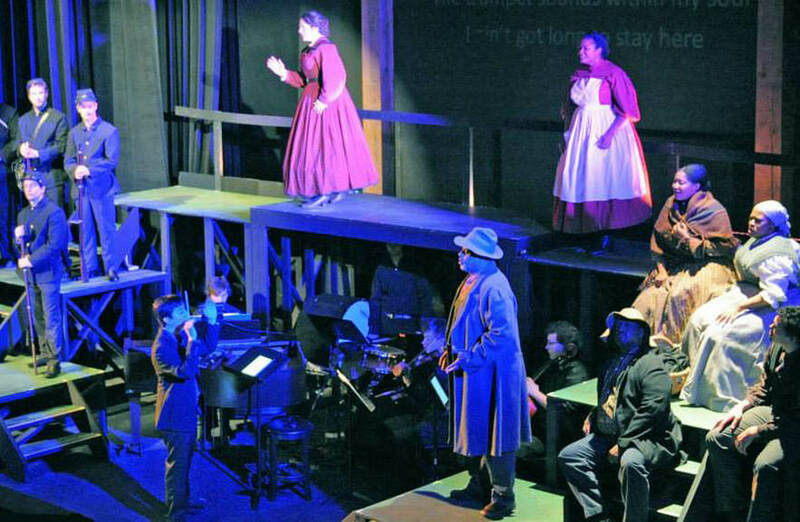 With music composed by David E. Chavéz and concept and libretto by Meredith Bean McMath, NORTON premiered in 2014 at the Franklin Park Arts Center in Purcellville, VA as part of the Civil War Sesquicentennial. The opera, supported in part by a grant from The Virginia Commission for the Arts, was produced by The Loudoun Lyric Opera Company and directed by McMath, NORTON featured opera singer Michael Forest in the role of Michael, and Jari Villanueva performing Taps. View the TWO-MIN TRAILER. This critically acclaimed musical adaptation of Charles Dicken's A CHRISTMAS CAROL, features Music and Lyrics by Diane El-Shafey, Accompaniment by Carma Jones and book adaptation by Meredith Bean McMath. Last produced in 2012 at Franklin Park Arts Center, Purcellville, VA, this unique musical combines original music alongside traditional 19th century music, and dance and party scenes that include 19th c. parlor games and dance forms. Retaining every charming - and frightening - feature of Dickens' "little ghost story” with rich music that deepens the characters and storyline and keeps the audience on its toes and always wanting more. “McMath, who adapted the classic Dickens novel for the stage, and Diane El-Shafey, who wrote the production’s original score, have surrounded Scrooge with all the teeming life that fills London... or any place with music — not just jingles that stick to the bottom of your shoe, but beautiful music that matters and makes sense." - Mark Dewey, DC Metro Theatre Arts, 2012. The Cratchit Family in song, L to R: Blake O"Brien, Tom Johnson, Archelle Skuce, Eliza Stribling, Avery Knapp, Zoe Skuce and Josh Derrow. Not far from the tracks stand four porches - four neighbors - uncomfortably close to one another: here is a widower and Railroad Foreman, Daniel Dunio, who has two young sons and way too many memories. Next door to him: Sharon McKenzie who's thinking of her husband stationed in Italy. When is he getting back, and how will she explain to him why she's taken in two foster children? And then there's Helen Tramonte, a waitress, now divorced with a young daughter, Jessica, who never speaks. Jessica’s silence is a mirror into the brutal past of her violent father... and a key to the deep distrust of men that her mother holds. And then there's the crowning glories of the neighborhood: spinsters Violet and Ethel Beck, both long retired from The Pennsy. Miss Ethel is meddlesome, but Miss Violet? ... she's something altogether different. Violet knows there are ghosts along those railroad tracks - ghosts and angels - that can help her neighbors heal in ways they’d never imagined. This Musical drama, based on the World War II-era civilian history of Altoona, PA, has concept and music by Tom Sweitzer and book by Meredith Bean McMath, Directed by Tom Sweitzer for its premiere production at Hill Playhouse, Middleburg, VA and at The Mishler Regional Theatre in Altoona, PA and again at Middleburg, VA (1999 and 2005), Porches will once more be produced in August, 2018 at The Mishler Regional Theatre in Altoona, PA by the Blair County Arts Foundation to benefit the ongoing restoration of the Mishler Tehatre. A comedy that gathers two music experts, their agent, and a group of unforgettable songs to create a night of pure entertainment. AUGUST 1966 — Opera Expert Nelson Eddington and Broadway Music Expert Jeanette McAvoy share a marriage and a love of music... but not much else at the moment. The couple has been hired to present an evening of romantic songs - from Broadway to opera - as a tribute to the soon-to-be-open Metropolitan Opera House at Lincoln Center. But, try as they may to rehearse, it's clear the two aren't going to be able to stay on topic. Or are they? Kim Shahbazian as Mary, singing Bizet's "Habanera"
This light opera was written by McMath on behalf of The Loudoun Lyric Opera Company and uses public domain Broadway and Opera music to take you from Vaudeville to Grand Opera... with lots of merry stops along the way.